This is an elegant and easy appetizer that is ideal for spring. It also works well if dinner is more complicated, as you can prepare this in advance and have it ready to impress your guests! If your asparagus is fresh, blanch it till just tender. Cool and set aside. 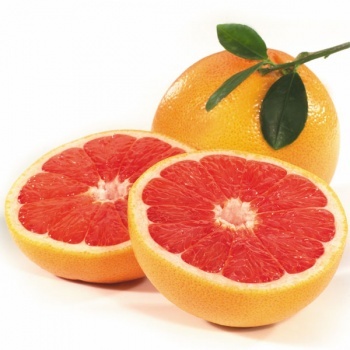 Cut a slice off the top of each grapefruit (where the stem attaches to the fruit), to make a cup. You can cut out the grapefruit segments and use the fruit as your serving dish, or cut a slice off the other end and then cut away the peel if you want to serve the dish in a small bowl. If you are extracting the segments, cut around the peel and cut away the central stem. Then slice the segments along the “seams” that are the skin, and gently pull them out. In a small bowl, mix the whipped cream and hot mustard, then drizzle in the 1 tbsp port. Add salt and pepper to taste. Spread this over the proscuitto slices. Place one asparagus spear on the long end of each slice and trim to make a manageable size. Roll and place in the grapefruit or dish. Zest the orange and set zest aside. Squeeze the juice from the orange and add it in a small saucepan with the 1/3 cup port and the orange zest. Warm over low heat. Once the sauce is warmed, pour a few tablespoons over each full grapefruit to flavour the rolls. Serve immediately or refrigerate until needed. Serve at room temperature. This pairs well with sparkling wines.